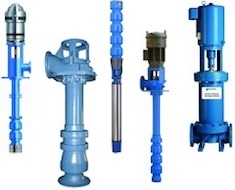 As an authorized manufacturer’s representative for Xylem/Goulds, Flow N Control can offer the company’s full line of submersible and surface-mount vertical turbine pumps for water and wastewater applications. Known for their superior performance and world-class engineering, Xylem/Goulds vertical turbine pumps are some of the most reliable on the market. Request a quote on Xylem/Goulds vertical turbine pumps. Contact Flow N Control to learn more. With over a century of experience, Xylem/Goulds designs and manufactures durable, dependable pumps for all applications. Their vertical turbine pumps are specially engineered to maximize uptime, efficiency, and versatility. A variety of models are available, making it easy to find the right vertical turbine pump for your water/wastewater application. If you’re not sure which Xylem/Goulds pump is right for your pumping needs, contact us to discuss your performance and application requirements. All Xylem/Goulds vertical turbine pumps are made in the U.S.A. in ISO 9001-certified facilities. These pumps are engineered to perform at the most efficient point of the curve to give you the head and capacity your system needs. Xylem/Goulds’ pump bowl assemblies (impeller, diffuser, and casing) are designed to deliver the required head and capacity with maximum efficiency. Multi-stage engineering offers maximum flexibility for future system modifications. Xylem/Gould’s casing design eliminates the need for special tools, making it possible to assemble and disassemble their pumps using standard wrenches. The flanged casings can be quickly and easily unbolted from the pump body, saving users time and money on service and maintenance. These pumps can be serviced in the field without disturbing system piping. Special two-piece shaft couplings allow for mechanical seals to be serviced or replaced without removing the pump motor. Motor couplings are precision balanced for vibration-free operation. The slip-fit suction covers on Xylem/Goulds vertical turbine pumps all but eliminate the negative impacts of tensile stresses and significantly extends the service life of the pump, particularly in applications that require frequent on/off cycling. The expert team at Flow N Control can help you select the most effective Xylem/Goulds vertical turbine pump for your unique needs. Request a quote on vertical turbine pumps, or contact us to discuss your pumping application.